Mazel Tov on the forthcoming bar/bat mitzvah of your child! This is an important milestone in the spiritual life of your child and your family. We at Rodef Sholom Temple want to help you and your family get the most out of this process and make this coming year and the bar/bat mitzvah itself an enjoyable experience for all of you. Click Here to Request RST Bar/Bat Mitzvah Guide. It includes policies, including the current bar/bat mitzvah policy and the hospitality policy, that are set by the Temple Board of Directors and are subject to change by vote of the board. Others are guidelines on how to make the weekend run as smoothly as possible. Please don’t hesitate to contact the Temple Administrator or the chair of the Ritual Committee should you have any questions. Coming of age for a Jew, which happens automatically at age 13 for a boy and 12 for a girl, is termed bar and bat mitzvah, that is, “son” or “daughter of the commandment,” and thus obligates the young person to perform the Jewish mitzvot (commandments). A ceremony marking the first performance of mitzvot such as being called up to the Torah to say the blessings (known as “getting an aliyah”) began in the Middle Ages. Earlier, the age of majority had little practical meaning because minors were “permitted” (though not “obligated”) to perform many rituals that were later reserved only for boys who had reached the age of bar mitzvah. A fifth-century rabbinic text references a blessing (still part of a traditional bar mitzvah) recited by the father thanking God for freeing him from responsibility for the deeds of his child, who is now accountable for his own actions. A 14th-century text mentions a father reciting this blessing in a synagogue when his son has his first aliyah. By the 17th century, boys celebrating this coming of age were also reading from the Torah, chanting the weekly prophetic portion, leading services, and delivering learned talks. 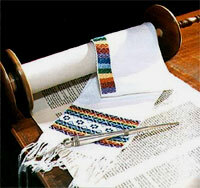 The bat mitzvah celebration made a late appearance in the United States with the bat mitzvah of Judith Kaplan in 1922. In the last half century, the bat mitzvah has been widely observed in liberal congregations, but has developed more slowly among traditional Jews. Since the bar/bat mitzvah is the culmination of an educational process that Rodef Sholom Temple provides equally to boys and girls, our policy is to hold the ceremony after the 13th Hebrew birthday of the child, boy or girl, although girls may be counted as part of the minyan from the age of 12 years and one day.